In Southern India the idol is usually in a garbhagriha and as far as I know only the priest can touch the idol. I have seen sai baba temples where you can hug the idol. How about outside the South? This answer is for Shiva Lingas and Shaiva temples. It is allowed to touch Shiva Lingas in temples and mostly it depends on Sthala Puranas. For example, in Shiva Mahapurana Lord Shiva says by touching Agni Linga at Arunachala (Tiruvannamalai) one will become free from Samsara. 20.The Linga confers enjoyment. It is the only means of worldly enjoyment and salvation. Viewed, touched or meditated upon, it wards off all future births of the living beings. 21.Since the Linga rose high resembling a mountain of fire, this shall be famous as Aruna mountain. 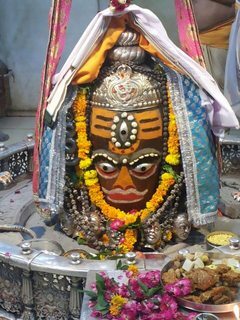 Similarly, Lord Shiva says those who touch Mahakala Linga at Mahisagara samgama tirtha will go to abode of Shiva. Kaumarika Khanda, Maheshwara Khanda of Skanda Purana describes Tirthas of Mahisagara Sangama in detail. 189-190. If the Linga is visited, touched and worshipped, those men will go to the abode of Bhava. Thus, O Phalguna, these seven Lingas came into existence. Those who listen to this and praise these are excellent men. They are blessed. At Srikalahasti, Vayu Linga is not allowed to touch even by priests, as it is believed once finger of a priest turned to gold after touching it (will update the source shortly), though there are stories of Bhakta kannappa, Spider (Sri), Snake (kala) and Elephant (hasti) worshiping the Linga. So, in most cases it depends on Stahala Puranas for Shiva temples. Here people are allowed to touch the main idol of Vithoba. Infact due to thousands of people constantly touching his feet, the feet has weathered away and you can't see the feet, but just the ankle. The idol is on a base of about 5 feet. Tall people can hug the idol's legs. You can see the live view of the temple online, on their official website. You can observe that everyone is allowed to touch his feet. I would have added a screen grab of that, but it is copyrighted, hence I haven't. 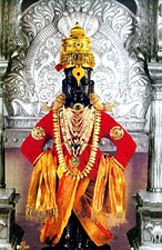 I have personally touched and hugged the main idol at Pandharpur, when I visited it 14 years back (because I was a child). However, a few months back, when one of my friends visited the place, they informed me that it is now restricted to only touching the feet. It would be interesting to see if they allow any VIPs to hug the idol. Almost every Shiva temple in North India allow the deities to touch the main shiva linga. 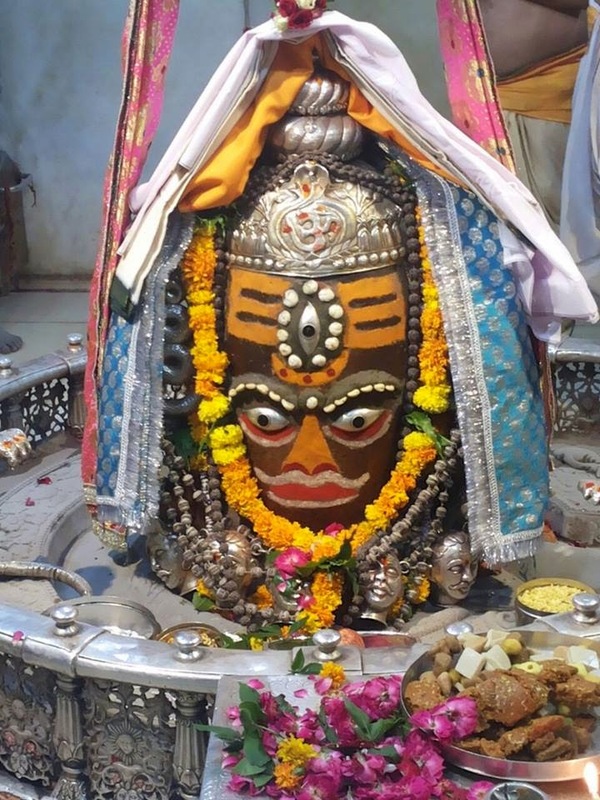 Here I have added just one example, because the shiva linga at Ujjain is large enough for people to hug. Here as well, the evidence is available online on the official website. You can see people touching the main shiva linga and offering. They allow small children to hug the main deity. In South India, at Gokarna, the priests allow you to touch the Shiva Linga. (In fact everyone who visits the temple are made to touch the main shiva linga). That said, the restriction of not allowing the general public to touch the main deity is more prevalent in South India than in the North. The presence of deity is invoked by specific mantras and rituals with those who carry the right kind of "space". This is possible after one gets trained in specific Agama Shastras of that temple. Only priests who are "trained"/initiated in the agama shastras of that particular temple are allowed to enter the Garbha and to touch the main deity of the temple. These priests are expected to live a certain lifestyle (including diet). Due to Northern part of India being on the receiving end of the much of the "attacks" and targeted killing of priests many deviations from these practices have occurred. That is why in the Southern India many such practices are still observed. Not the answer you're looking for? Browse other questions tagged temple idols .